There’s a bit of psychological preparation necessary and intrinsic to flying, at least since the G.W. Bush years of 9/11/2001. 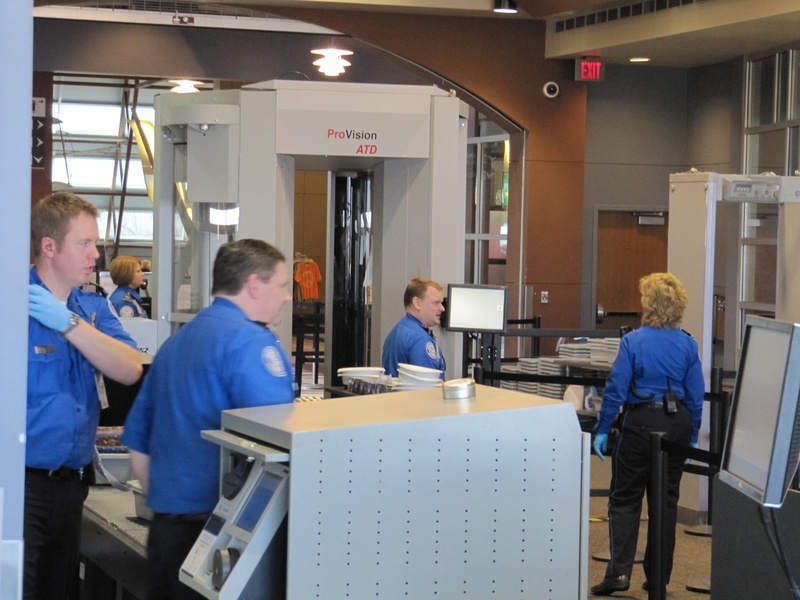 This is how my experience played out on April 11, 2012 with the friendly Airport Security citizens in Fargo’s Hector Airport. Typically a passenger approaches the nylon cattle gates and begins to mentally cycle through exactly which order they ought to temporarily remove the necessary items and elements from their persons. Keep smiling, folks, keep smiling. Your friendly Airport Security People at work. They are doing their job. Now remove your bracelets and rings and necklaces and cell phones, rip that belt off your pants, then shoes (Thoughts of “Hurry! Untie those damn shoes because a line is building behind you and you’re holding the whole damn show up!! !” rattle through the brain and smiles remain on the surface), wallet (there goes my identity), pens in your pocket, keys (whoops — security just inherited another small Swiss Army tool of mine, once again), change, watch (if for some reason you’re still wearing one), and then take the laptop computer out of your briefcase and, if you prepped ahead of time, remove the ziplock baggie full of gels and liquids (toothpaste, contact solution, deodorant) that you remembered to purchase the night prior at a Target or an Über-Walmart. Then you get (you don’t “have to” if you want to fly) to be instructed through the latest in technology, the ProVision ATD. It’s basically pretty sweet. My only critique would be to design a monitor for the person being scanned to watch as well. The same monitor that the Airport People get (or have to) look at. Step into the cylinder and throw your hands in the air so the two vertical batons can swoop around your front and back and sides. Whoosh, whoosh. “You’re free to step this way, sir.” Nice, they called me “sir” — automatic knighthood (Quixotic Romanticism still in our 21st-century lexicon). This entry was posted on Wednesday, April 11th, 2012 at 10:00 am	and posted in Uncategorized. You can follow any responses to this entry through the RSS 2.0 feed.